In response to that, I wrote a “German Gender Poem”. Lucky me if you don’t understand it, because it really is not that outstanding (in terms of meaning… I suppose…). According to T-Rex though, alone the fact that it only uses (in this case) masculine nouns should make it kind of brilliant! denn sein Rücken war nicht grad’. denn er wusst’, bald würd’ er liegen in einem Sarg. denn sein Abschied nahte rasch. und aus seinem Körper würd’ werden Asch. Not a massive amount of nouns, but anyway, I tried to use at least one per line. der Hut, der Kopf, der Rücken, der Zahn, der Knopf, der Saag, der Kummer, der Schauer, der Abschied, der Nu, der Körper, Asche. And for those of you who speak (some) German and are now utterly confused, I should probably admit that I did cheat with that very last word. Die Asche, feminine noun. Eek. How do you actually know that Nu is masculine? Since it (apparently, correct me if I’m wrong) only occurs in the phrase ‘im Nu’, how can you tell if it is masculine or neuter? If you have only ever heard it in that phrase, you have nothing in your memory to tell you that it is masculine rather that neuter. True, the dictionary says it is masculine, but how did the dictionary-maker know that? I suppose you will say it just ‘feels’ masculine to a native-speaker, but these feelings are not supernatural and must be based on something. 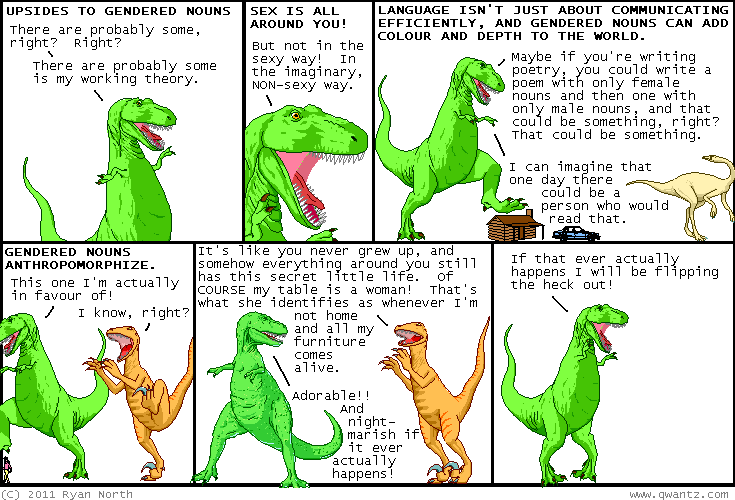 This entry was posted on 08/04/2011 by G in Academia, Creative Writing, in German, Linguistic Musings and tagged articles, dinosaur comic, gender poem, German, poetry.